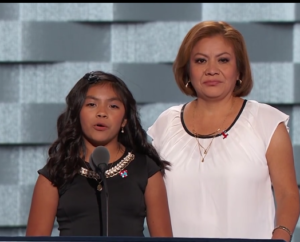 An 11-year-old girl from Las Vegas delivered the ONLY speech I’ve watched this entire election cycle. I cried when I watched it today. My childhood best friend was a first generation American born Latina whose Mexican parents fought for years for their U.S. citizenship even after her father was drafted and served multiple tours in Vietnam. They were solace and safety in the midst of the upheaval, abuse, rebellion and dereliction that was my youth. He fought in Vietnam and she worked in a bank and they did side jobs and made tamales at Christmas and sent money to Mexico for their families and loved me unconditionally and they were somehow less than? Immigration is a wildly misunderstood issue in the States. It’s complex. It’s debilitating. It impacts generations. It’s much more than “people sneaking across the border, through the desert taking our jobs, smuggling heroin, stealing our benefits, plotting terrorism.” If that’s your take on it, you’re ignorant. Perhaps willfully so. Immigration is kids like Karla living in fear. When she said “Soy Americana” my heart almost imploded. Immigration is a PhD candidate getting sick, missing classes and then overstaying his visa to finish school while working two jobs and living in a townhouse with 5 other PhD students. If he goes home without his Doctorate he won’t be able to support his mother and father and younger siblings–after his parents spent everything they had to send him here. That was more than airfare, btw. It was years of paperwork and fees and education in Somalia (or Eritrea or Vietnam or … name the country). His parents worked their whole lives to send him here, to college. He’s “illegal” now because he had the flu and missed class. Immigration is a confident, beautiful, talented designer lying awake at night in the city she’s lived in since she was 9, wondering if her DACA extension will be granted. Wondering if the dozens of pages she completed and mailed out months early were all signed because she knows it will cost another $500 to redo it if she forgot to check a box or sign a line. It’s not knowing she was “illegal” until she started college and a scholarship was rescinded. It’s the fear she feels when she leaves the immigration lawyers office after hearing “your best bet is to find a man and get married, get your papers. If not you’ll have to go home and apply for a Visa from there.” She IS HOME. She works full time, freelances and donates hours of design time each month and her “best bet” os marry someone so she can stay? It’s the apprehension of applying for a new job because she’s ashamed to have the conversation about her immigration status; even though she’s here “legally” for now. ZERO school debt, btw. She and her mom worked and she paid for each semester as she attended. Imagine that. Immigration is the men and women who served as interpreters and cultural advisors for us in Afghanistan and Iraq, saved OUR LIVES and then stood in a proverbial cloud of dust as we drove away, promising to bring them to the States, to safety only to end up in a decade long quagmire of red tape and paperwork and fees they can’t afford or process or complete. “Thank you for your service, Rahoula.” Deuces, dude. Immigration is an American Airman stationed in Europe, marrying someone there, having children and eventually receiving orders back to the States and learning she’s not “really married.” While their family grows, struggling to help her husband find meaningful work in the nations capital, digging through the mounds of paperwork. Immigration is admitting children to schools in Dallas and then telling the teachers they’re not allowed to use Spanish in the classroom because the kids must assimilate. Right. Because science isn’t hard enough to learn without trying it in a foreign language? Immigration is refugees fleeing war and atrocities, leaving behind their own businesses and families and education, hoping to resettle, to perhaps be safe… and learning they have to live in a tent in the desert because no one understands their culture. Canada puts the US to shame on this front. Immigration is staying in an abusive marriage because your partner is the key to your citizenship. Immigration is more than this self important, entitled, fear mongering blasted from televisions in homes across America. I’m sick to DEATH of the idea that, because you were born in the right grid square, you’re somehow worth more or deserve more. Especially in a country without any type of compulsory service requirement. No one is less than. An 11-year-old should worry about things like science camp, swimming lessons and braces. Not coming home to an empty house.